One of my favorite collaborations is the one I have with Biff It, an amazing activewear line that's all about female empowerment and overall kickassery (and yes, I did just make that word up). What I love about Biff It is that although the line is very much about making women feel strong and powerful, it also doesn't take itself too seriously. This is illustrated through the funny, pun-filled (or punny, for short) sayings on some of the tees and tank tops. Any A Tribe Called Quest fans out there? Well this shirt is for you. 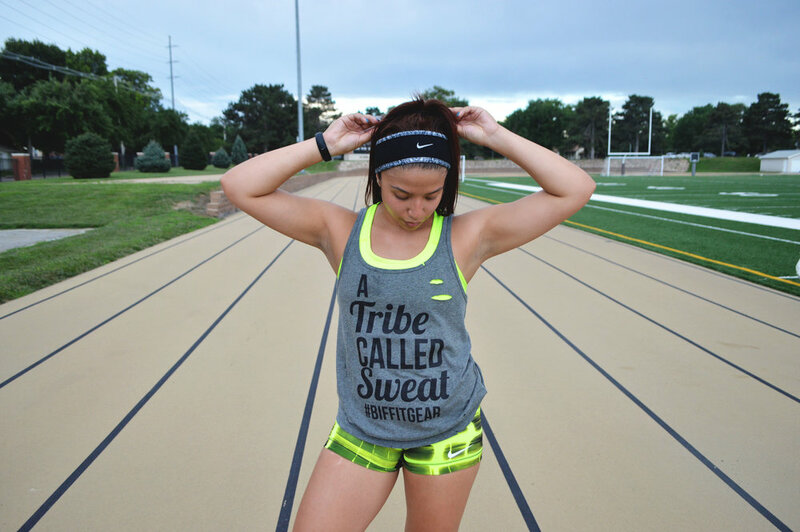 As if the "A Tribe Called Sweat" mantra weren't awesome enough on its own, this 100% cotton tank also features a relaxed fit and a slightly distressed finish for an "I'm-so-badass-I-ripped-my-shirt" vibe. Best of all, Biff It is offering my followers and readers 20% off their entire over at biffitgear.com! Just use my code rivasraves at checkout. I paired this top with my Nike running essentials: Pro Combat sports bra and compression shorts, FuelBand, fleece headband, and Free 5.0 trainers. Now who's ready to hit the track?